I joined the Navy in May 1945, two weeks before my 18th birthday. 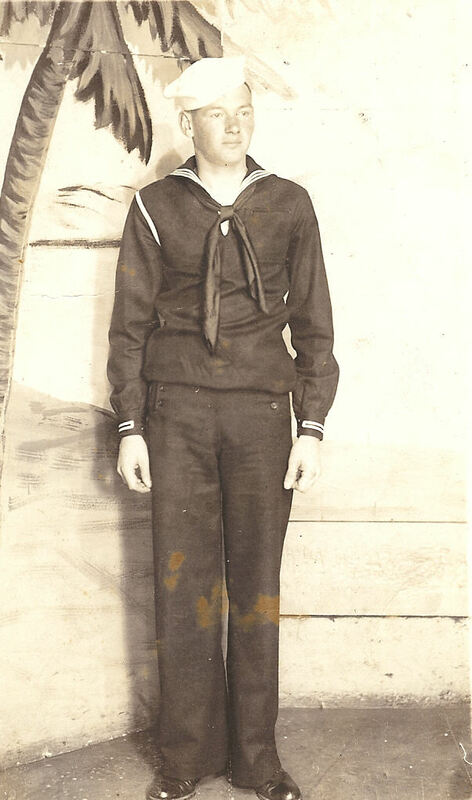 I got out of boot camp at Great Lakes Naval Training station around August 1945. I was then sent to a naval station near Redwood City, Calif. I sailed from San Francisco on APA #? , an attack transport. Around about this time we dropped the atomic bomb on Japan and the war ended. We stopped at Honolulu for a few days. We had no idea where we were going. Some said it had to be the tropics since we were issued mosquito nets. Finally, as we crossed the China Sea and started seeing sailing junks, we were told what our destination was. We landed and were moved into a base at Taku Bar (Tangu). What our mission was I don't know. There was a US Marine base near us, and I seemed to spend a lot of time going back and forth there. As I recall it was 1st Battalion, 5th Marines. I know I gained a lot of respect for the leathernecks. Most of them were tough veterans of the Pacific campaigns, and had earned a rest. But they were still spit and polish, always in freshly pressed uniforms, engaging in close order drill on a regular basis. From time to time I went to Tientsen on shore patrol duty. I also went to Peking, the Forbidden City, etc. I recall Chinese money was exchanged for a rate that fluctuated around 5000 Chinese dollars for 1 American dollar. When we exchanged our dollars for Chinese money, we'd run into a hotel to check the exchange rate, as it changed hourly. I really got to like the Chinese people. They were polite and friendly, and tried to be helpful. We had a number of Japanese POW's on the base. They were more aloof and stoical than the Chinese. When we were required to round up a working party for a project, we always tried to get the Japanese POW's instead of coolies. The Japs could operate equipment and seemed more business-like than the coolies. A few Japs could do in a short time what twice as many coolies could do in twice the time. I left China in the summer of '46. Veterans were being sent home on the basis of "points" . The people who had been away the longest had the most points and were the first to return home. All in all, I enjoyed my tour in China. It was quite an experience for an 18 year old who'd never been more than a couple of hundred miles from Savannah, Ga.